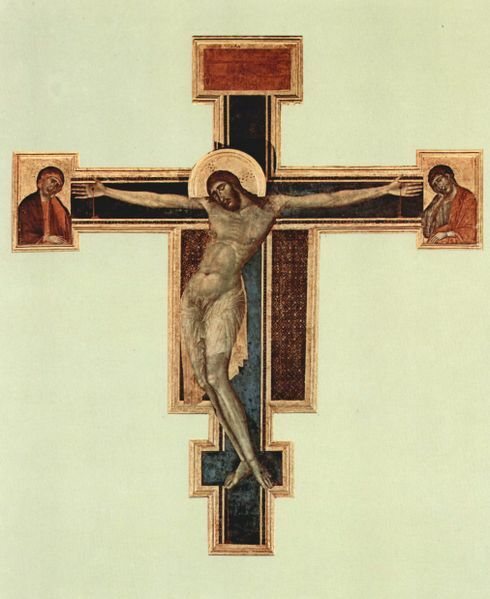 Cimabue was the last great painter working in the Byzantine tradition. He was born in c.1240 and died c.1302, and is well known as the master to his famous pupil Giotto. He was also a highly regarded Florentine painter in his own right and also a creator of mosaics. We can see by comparing the work of Cimabue and Giotto just how radical Giotto's break with the Byzantine era really was. 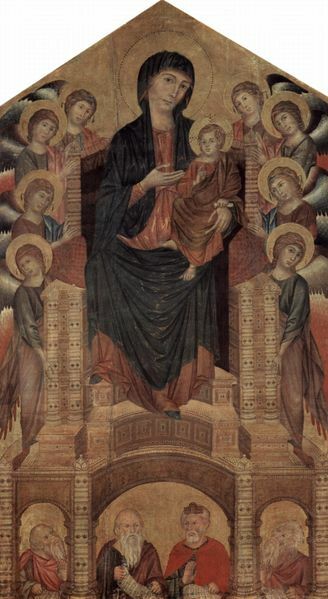 The Madonna and child of 1280, although stylistically much improved from many earlier Byzantine efforts, occupies a flat space with little or no depth within the work. It has the conventional gold background but the figures rise above each other and seem very two-dimensional, almost like the faces on a pack of playing cards. In the Ognissanti Madonna, Giotto's efforts have created a work that recedes in depth. 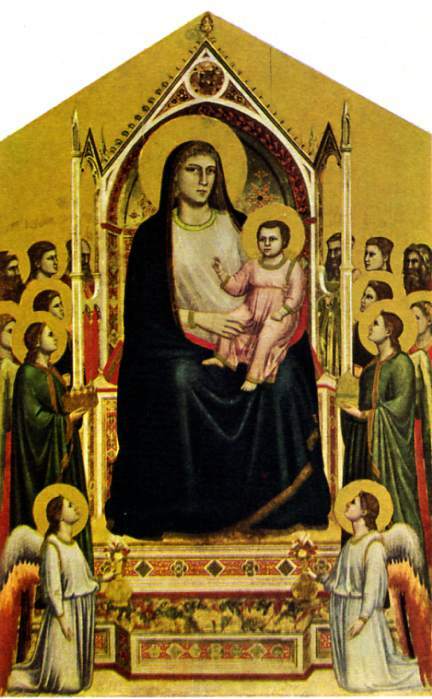 The Madonna is firmly seated on a three-dimensional throne and the figures at each side occupy a much deeper space in comparison to Cimabue's. The kneeling angels in the foreground give a sense of distance between them and the enthroned Madonna, and the sculptural effect is complete. Very little is known about Cimabue's life and few of his works survive, but we do know he was commissioned to paint frescoes for the Basilica of St. Francis of Assisi. It is unfortunate that his work has deteriorated due to damp and the fact that his colours were applied when the plaster was not fresh. What remains is a mere glimpse of how the works must have appeared when they were first painted.